What can I say but WOW! Parker is re-writing some Marvel history – but in a good way. 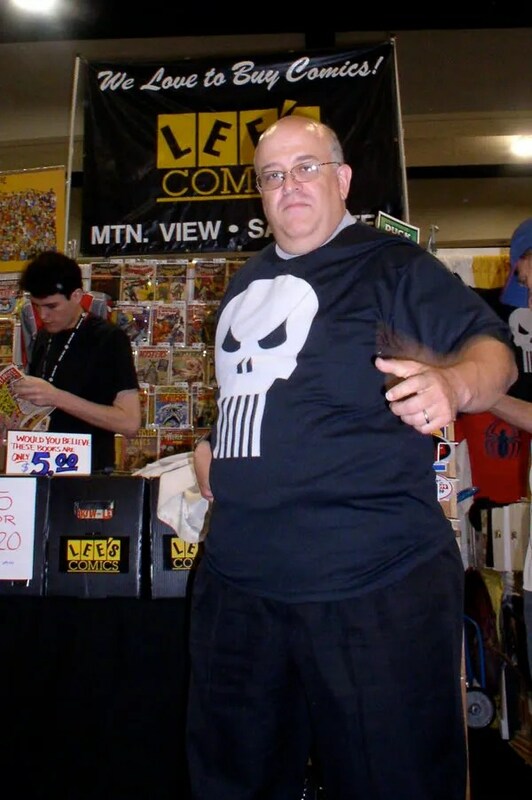 It’s amazing that everyone writing this storyline can do a fantastic job – except the person who started it… No, no – I will not turn this into a Loeb bashing post… like most of my Hulk posts are today – I will instead focus on the book I am reviewing. So, the Red Hulk enters an A.I.M. base – where he encounters A-Bomb who has been trailing him on Bruce’s behalf. 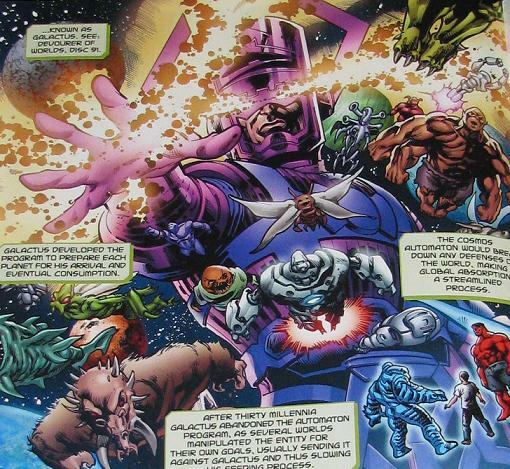 While in the base, and while searching for a doomsday device, they encounter the M.O.D.O.C.K. cloning room. They dissect the clones and harvest the parts in case M.O.D.O.C.K. needs them. Pretty gross and, I might add, awesome! Look at the big brain on Brad! 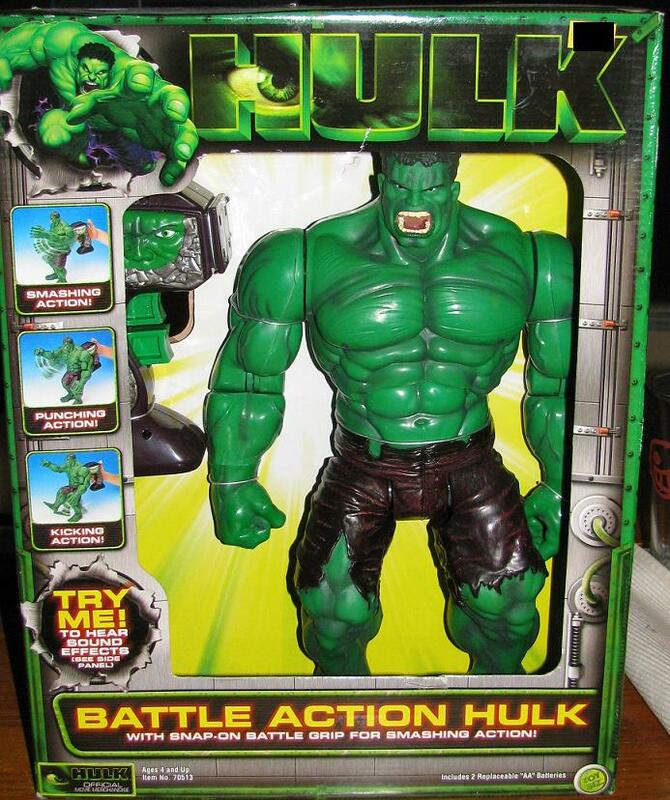 The find the Doomsday device – which happens to be the Hulk Robot. 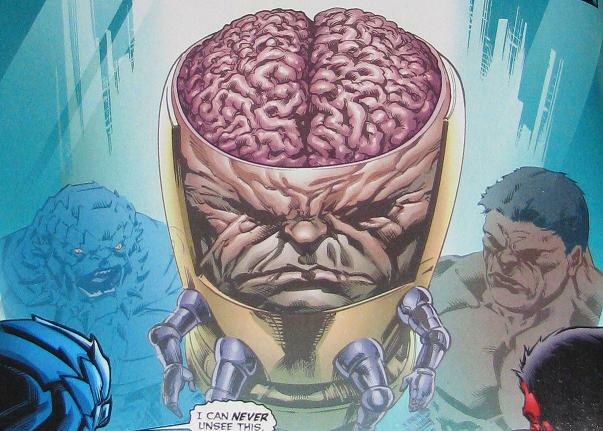 As they learn about the history we also learn that it was the Mad Thinker who actually created the robot – not the students who claimed they did in the Eternals. What a great addition to the history of this thing! 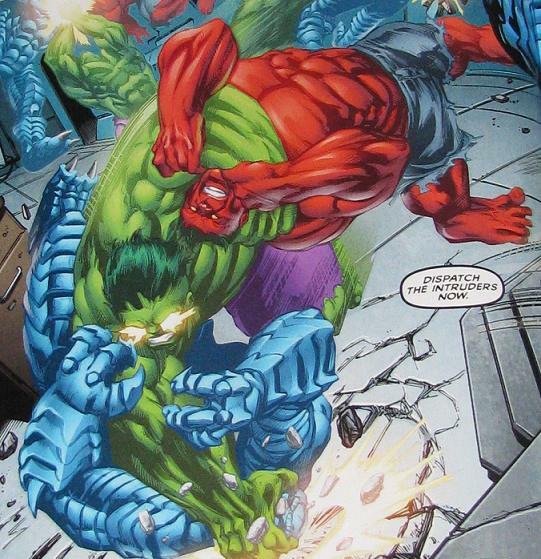 But in trying to destroy the robot – the Red Hulk actually activates the thing! It begins to repeat the incantations that Doom was saying in #606 – and even repeats what A-Bomb and Red Hulk are saying to it then – as well as soaking up cosmic energy from the Red Hulk. It takes on both of the power houses and tosses them around like rag dolls. The Leader and M.O.D.O.C.K. appear on the screen to tell the Red Hulk that this has been a set-up the whole time. 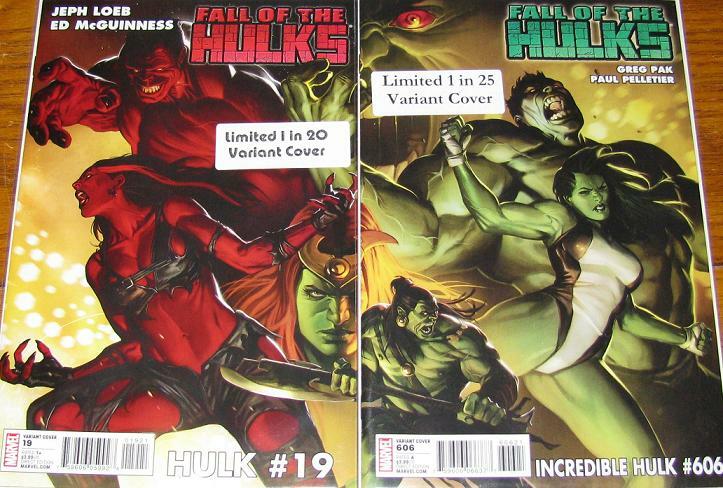 The base blows up – and A-Bomb and Red Hulk head back to see Banner. Banner, who, for the first time, actually seems surprised at the events going on – and isn’t aware of it. It’s a less “in control” Banner than we have seen in the pages of TIH – I’m not sure how to feel about that exactly, but it works for the issue. The Hulk robot takes on the A-Bomb and the Crimson Idiot! As Banner investigates the disc that holds the history of the Hulk robot – a new, awesome, piece of information is dropped – namely that the actual creator of the robot is none other than GALACTUS! Big G used to use an automated program to get planets ready for consumption – but then later turned to creating heralds. Banner is worried about the amount of power that they have on their side. 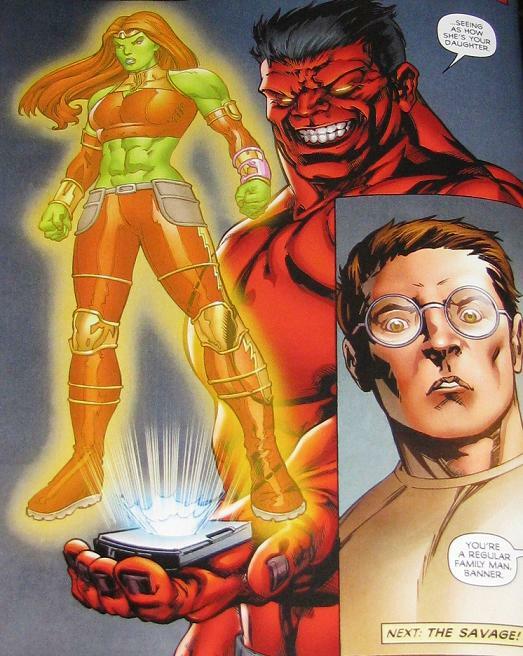 He is worries they don’t have enough… and that’s when the Red Hulk drops the bomb about Banner having a daughter – namely… Lyra! Banner finds out he is a father... for a second time! 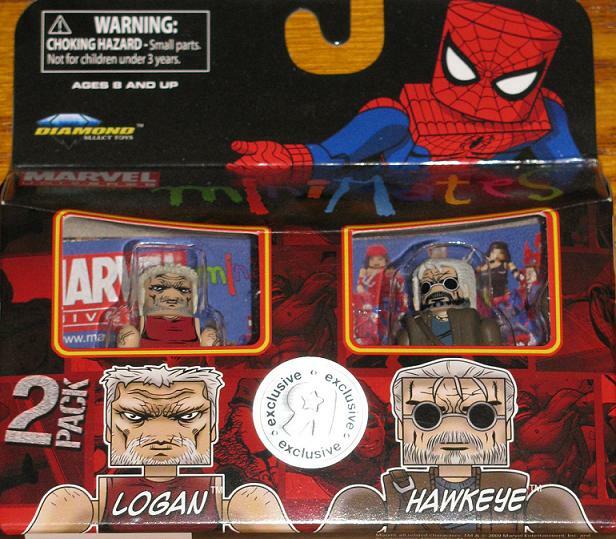 I know this really isn’t Hulk – but it’s related indirectly – so… anyways, TRU has the exclusives to the minimates – and yes to all who have told me about the Planet Hulk Minimates coming out – I have seen it and think it looks cool! Man, I have been so busy lately – but have a lot of pretty grand things to show you guys… I just have to find the time to take pictures and post them! Anyways, this storyline was one of the best to come out of Marvel in a long time – yes, there are issues you can take with the details, such as the Hulk having an entire inbred family – and the Hulk eating Logan at the end – even though he has an adamantium skeleton… but all in all – it was bloody, graphic and awesome! 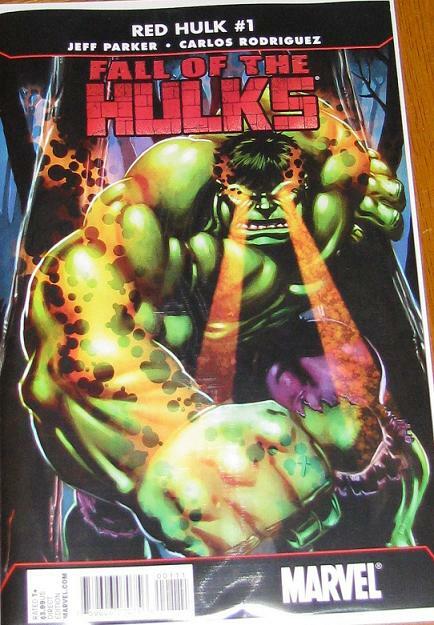 Peter David – Hulk Volume 7 out tomorrow! Just a reminder that Marvel Visionaries: Peter David – The Incredible Hulk volume 7 is out tomorrow – make sure you pick it up! Don’t forget about this one completists! 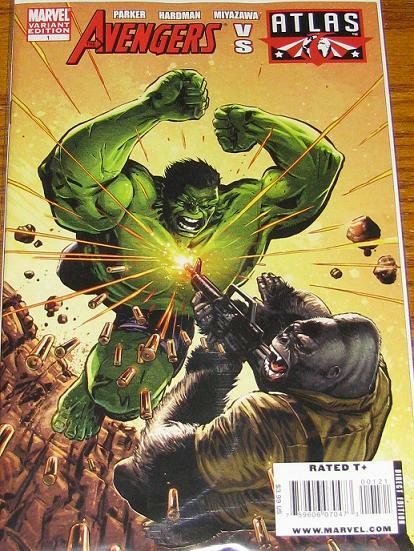 The Avengers / Atlas comic this past week had a variant cover this week featuring our ever loving Jade friend! 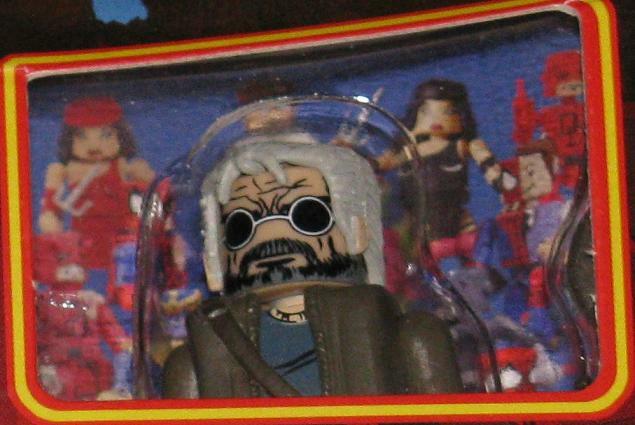 The strange part being, he doesn’t actually appear in the issue. But if you are a sucker completist like myself – then make sure you pick this one up! You’re supposed to read this issue first – now, at the end of 605 Skaar is considered a hero – and here they throw him a parade. But Banner sees Betty in the crowd. He jumps off the float – but is unable to find her. Reed is worried that it was some sort of trick – but Bruce knows it was her – it wasn’t a LMD or anything. Bruce teleports to New Mexico to see the Red Hulk. The Red Hulk asks why Bruce isn’t in Latervia – Bruce asks why he isn’t in NY. Then Bruce shoots the Red Hulk in the face with an Old Power Taser. 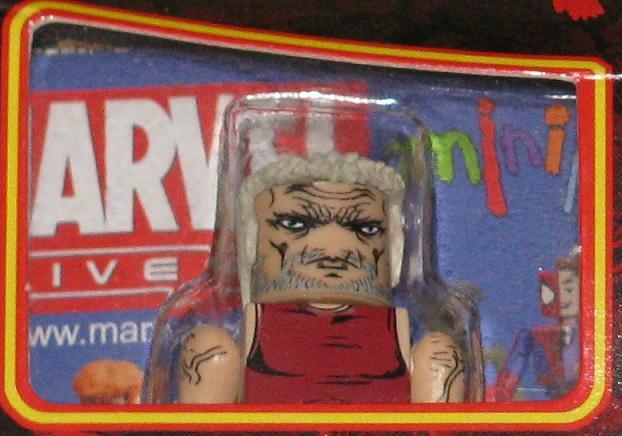 He tells him that he saw Betty – and the Red Hulk tells him to stay focused. They have a few more words – a pretty great conversation – the Red Hulk actually seems smart and menacing – not like in the Loeb book where he just seems one-dimensional and stupid. Bruce sees Betty... is that a banana in his pocket? 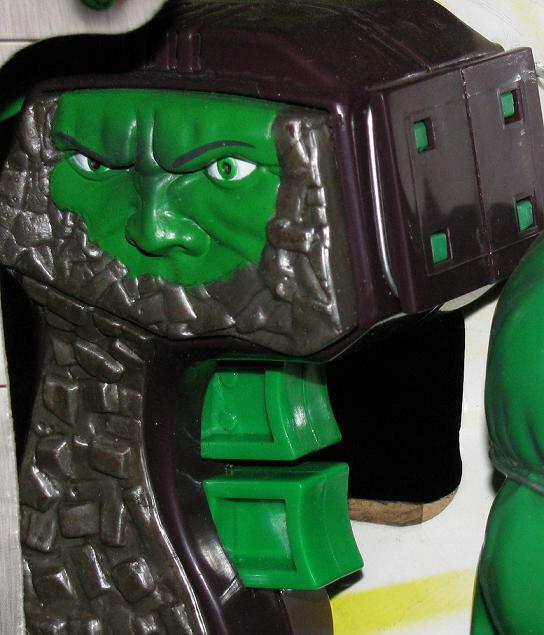 So – the Hulk heads to Latervia and on the next page we see the Green Hulk break through the castle wall, attacking Doom. They battle for a few pages – but Doom comes out victorious – and I don’t know about you – but I knew it was the Hulk robot even before I read the issue – but still – Skaar does not. 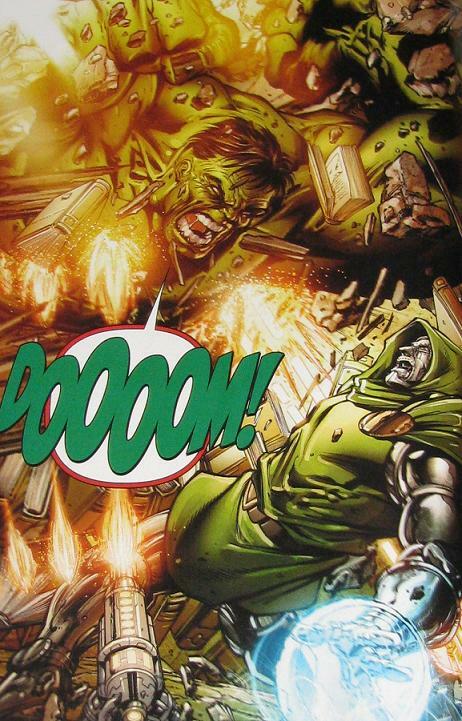 So, as Doom is about to lay a final blow Skaar comes out swinging. 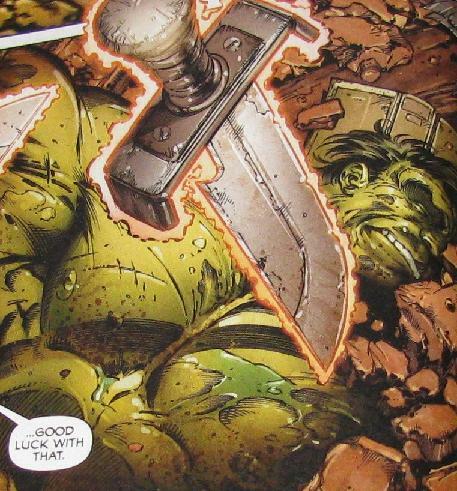 Doom and Skaar battle – but Doom throws Skaar’s sword at the Hulk and stops it inches away from his head. 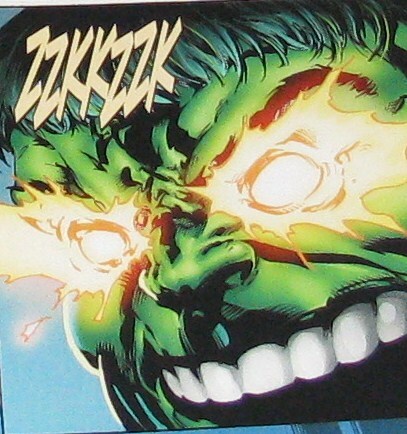 Skaar turns his attention from Doom and Doom attacks. 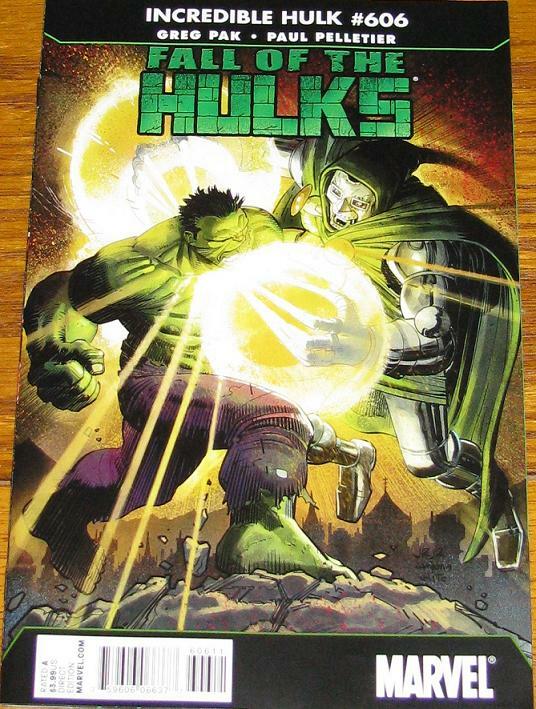 Using magic he beats on Skaar and reveals that the Hulk is actually a robot. Skaar reverts back into a child – and Doom is about to kill him when Bruce comes to the rescue. 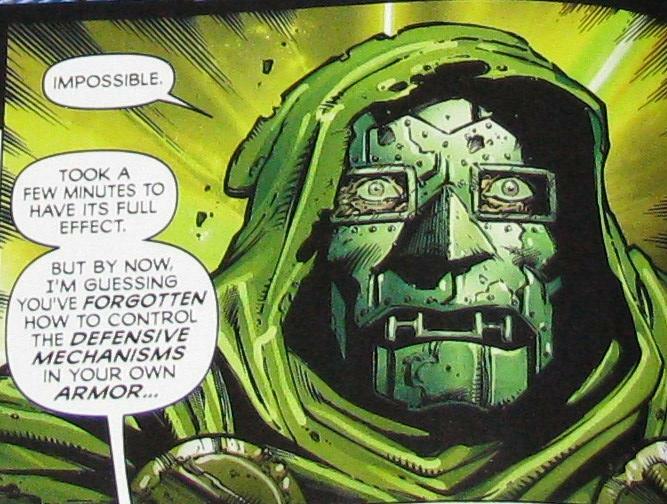 Bruce surrounds everyone in a Gamma Bubble – making it impossible for Doom to use his machines – which Doom scoffs at because he still has his spells – unless of course he can’t remember them – which he can’t – because the robot Hulk, in which Doom absorbed the cosmic power from – also had a some poison – put there by the Leader – who sent the robot to take out one of the 8 smartest people… Doom being… I don’t know… #7? The robot Hulk comes back to life to take Doom away. 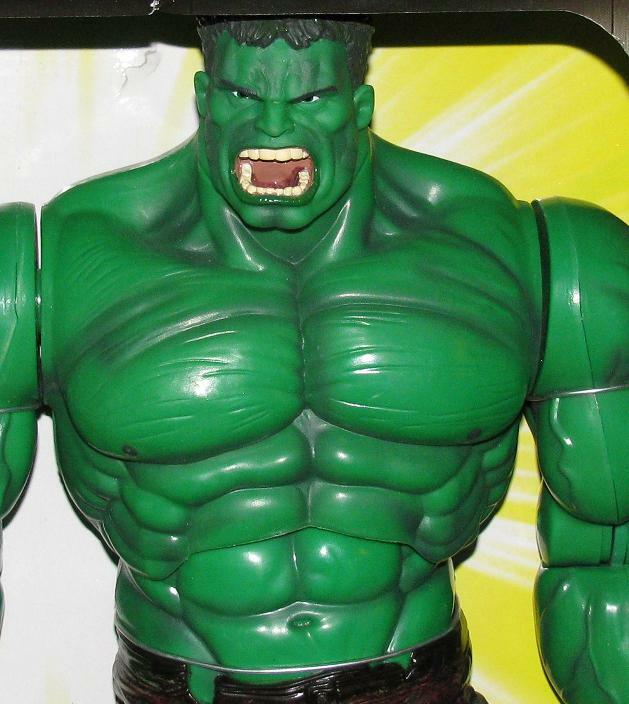 Bruce tries to reach out to child Skaar – but Skaar is still angry. Angry at Bruce – basically for loving Betty so much that he doesn’t care about anyone else. Big Skaar comes back and Bruce tells him they need to go save the Avengers. There is also a back up story about the Red She Hulk – she fights the actual She Hulk – and the ending has Jen dying – pretty shocking! Check it out!